Just search Amazon for “marine battery charger” and you’re bound to feel overwhelmed. Buying the best marine battery charger is not as easy as you think, there are many things you have to consider to find a charger that best suited to your marine batteries, and that’s not including a ton of competing brands. A marine battery charger is probably the least expensive part of your boat, but it has a vital role to keep your batteries healthy and maximize performance. A good marine battery can be charged up hundreds of times, may last you anything from three or four years to a decade or more, but could be getting damaged completely through just one time of using the wrong kind of charger. That’s why a marine battery charger is as important as the batteries you put into it. But what should I do to find the right one? We decided to do the legwork for you, interviewing experts and spending more than 80 hours researching and testing some of the best marine battery chargers on the market. We’ve learned that if you want to make the most out of your charger and extend the life of your marine batteries, you should only buy your charger from trusted brands like Minn Kota, ProMariner, Marinco, NoCo, Schumacher or Xantrex. A charger from these brands may cost a bit more than others, but they can help you save time and money in the long run. You won’t find any marine battery charger that is better than the Minn Kota MK 330 PC Precision On-Board 3-Bank Charger. This is one of the fastest and most advanced chargers so far. You can NEVER say that you have never heard of Minn Kota! Just like their electric trolling motors and other boating accessories that they produce, this on-board charger is made with the same quality and reliability in mind. Many professional boaters who are on the water daily like to use either a deep cycle or starting battery for best performance and battery life. 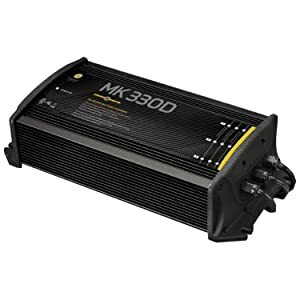 This Minn Kota MK 330 PC Precision charger has the ability to charge different types of batteries at the same time, therefore it would be very convenient if you will be using a Gel battery for trolling and an AGM battery for starting the motor engine. Not many marine battery chargers from other brand names allow you to do that without affecting the battery performance and life. There are yet many cheaper marine battery chargers that you can buy but basically, you get what you pay for. Our second pick is the ProMariner 43012 ProSport 12 12-Amp 2-Bank Battery Charger – this is not only one of the best marine battery chargers on the market, but also one of the most popular on-board chargers so far. ProMariner is owned by Power Products, LLC – an American company which is one of the world’s most successful manufacturers of premium power products and charging system technology for the marine industry. Power Products LLC is also home to industry leading brands Marinco, Mastervolt, BEP, and Anchor. Therefore, ProMariner is a brand that you can definitely trust. 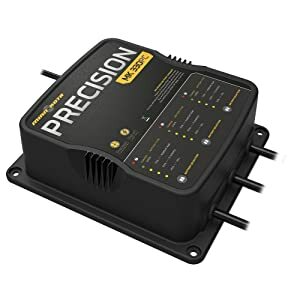 The ProMariner ProSport can automatically charge and maintain engine crank battery while sensing and distributing 100% of the available charging amps to trolling motor or house bank battery. How to Choose the Best Marine Battery Charger? You know you need a high-quality marine battery charger, but you don’t know which one to choose. We have broken them down into several steps that will help you decide exactly what you need. There are 3 main different types of batteries that can be used in a boat: flooded (wet cells), gel, and AGM batteries. Flooded batteries can handle overcharging better than gel and AGM batteries, because of this hydrogen venting and because they are not sealed like the other types. 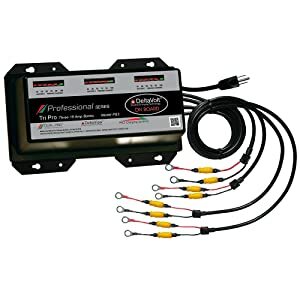 Flooded batteries do require regular maintenance and off-season charging, so if you’re using flooded batteries on your boat, make sure that you select a charger that has a maintenance mode, like the ProMariner 43012 ProSport. The simple definition of maintenance mode is that voltage is continuously applied to the battery terminals. The amplitude of that voltage varies between 0.2 volts and 0.6 volts above the rest state voltage of the battery when it is fully charged. The purpose of maintenance mode charging is to maintain the battery in a fully charged condition so that when it is called into service, it will be able to deliver its full charge capacity. AGM batteries are so far the most popular type of marine battery. This battery type is much better than the flooded version in marine environments since they are maintenance-free and provide better shock and vibration protection. As with all gelled and sealed units, AGM batteries are sensitive to overcharging. A charge to 2.40V/cell (and higher) is fine; however, the float charge should be reduced to between 2.25 and 2.30V/cell (summer temperatures may require lower voltages). A conventional charger for flooded lead-acid often has a fixed float voltage setting of 14.40V (2.40V/cell). The best marine battery chargers for AGM batteries should be rated for charging AGM batteries. Gel batteries are manufactured to very high-quality standards. However, these batteries have a very narrow charging profile, they need carefully regulated smart charging to prevent damage. All of the chargers that we’re introducing to you in this guide are capable of charging most Gel batteries. The multiple outputs of some marine chargers are designed in different ways. We usually prefer units that have a separate positive and negative connection for each output, and a separate microprocessor as well. This allows batteries of different type, size, and state of charge to be connected to the same battery charger. 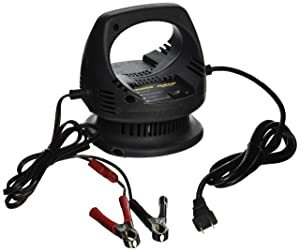 So, a three bank charger can be used for a three battery boat with a single 12 volt starting battery, and two other 12 volt batteries in series for a 24-volt trolling motor. Some folks wanting charge their marine batteries in 24V or 36V series should look for a marine battery charger with the more output voltages, like this Dual Pro 15 Amp/Bank Professional Series 3 Bank Charger (12V/24V/36V). When you charge your batteries with a 24V or 36V charger, that means you are connecting them in series and charging all of them up at the same time. However, charging this way in some cases would affect the battery performance and life. Because the charger will stop charging when the entire group reaches a certain voltage. If the batteries are not each at the same voltage, this means that one battery is charging higher than the rest, and one is not charging as high as the rest. This will not give you the most usable capacity out of the pack, and will likely lead to one or more of the batteries reaching the end of their usable life sooner than necessary. The best marine battery chargers should have the ability to protect your batteries in those cases, but using a multi-bank smart charger with two to four banks, will always provide you a better performance. And bear in mind that when you charge batteries in series, ensure that all of your batteries are at the same voltage, same capacity, and same type. Some serious boaters prefer 6V golf cart batteries to 12V batteries for a higher capacity or smaller footprint (most common in solar storage systems). One 12V or 24V charger can be used to charge these batteries. But if each 6V golf cart battery gets its own positive and negative from the charger, the charger would work better and even faster. 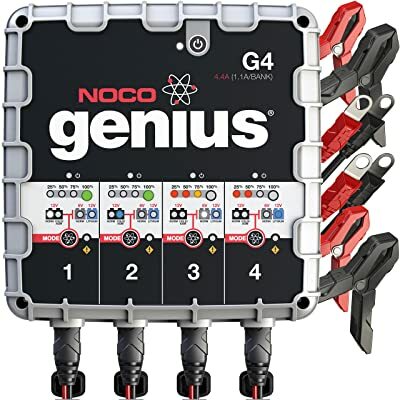 If you’re having less than 4 of 6V golf cart batteries on your boat, using a 6V multi-bank charger, like this NOCO Genius G4 6V/12V 4.4A 4-Bank UltraSafe Smart Battery Charger, is an excellent way to charge them. We don’t mean physical size, but how many amps your charger needs. Boats that spend most of their week at a dock, constantly hooked up to shore power, so in most case using a high-amp charger is not necessary. A good rule is to have a charger that provides 5 to 10 amps of output current per bank. If you have 3 batteries and each is about 100 amp hours, a 3-bank 10A charger like the Minn Kota MK 330 PC Precision would take about 11 hours to recharge it if the battery were completely dead. To calculate your total charge time, a good rule of thumb is to take the amp hour rating of the battery and divide by the charger rating and then add about 10% for the extra time to totally top off the battery. Most of the marine battery chargers on the market are designed to charge batteries by hooking up to the shore power. But what happens when your boat is away from shore power and your batteries are low? The only choice you might have is to charge your batteries using a generator. Using an inverter generator is the best way to charge your batteries when shore power isn’t available. This kind of generator has a 12V DC output built into them, however, trying to charge a battery using this is almost a waste of time. The 12V DC output is usually limited, the voltage can fluctuate and can shorten the battery life. 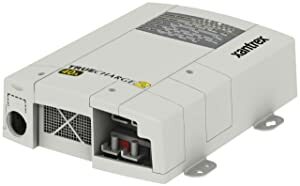 The best way to charge batteries on your boat with a generator is to connect a Smart Charger to the 120V AC outlet of your generator. But as the output voltage of an inverter generator is not regulated, most smart chargers on the market are not suitable for use with a generator. Xantrex TRUECharge2 is the only name that we think can protect your batteries against voltage fluctuations, flicker, voltage drops or failures of the generator. Xantrex TRUECharge2 chargers are some of the best marine battery chargers on the market. They feature low electrical interference and superior, efficient, power factor corrected multi-stage charging. However, these high-quality chargers are not cheap. This Minn Kota MK 330 PC Precision On-Board 3-Bank Charger is designed for years of service and reliability. It has the ability to charge different types of batteries (AGM, gel or flooded lead acid) at the same time. This feature protects the batteries from damage due to over- or under-charging. Minn Kota MK 330PC and other Precision Onboard Chargers deliver longer run times, shorter charge times and extended battery life. They are designed for permanent on-board mounting to eliminate the hassle of traditional portable chargers. By controlling the current and voltage during the charging cycle, these Minn Kota chargers recharge faster than conventional automotive battery chargers while preventing overcharging which can damage and shorten battery life. Minn Kota produces some of the best marine battery chargers on the market. You can’t go wrong with their products. This Minn Kota MK 330D On-Board Battery Charger can charge any type of marine battery, it features enhanced status codes to display charge stage, maintenance mode status, error notifications and full charge, and the automatic shut-off feature extends battery life by shutting down when charging is complete. It uses a digitally controlled microprocessor with three charging banks, and it gives 30 amps total output. Like any other Minn Kota battery charger, this unit controls the voltage and current your battery gets throughout the three stages of the charging cycle for a safe, precise charge. 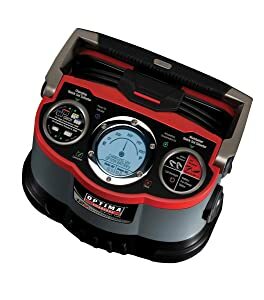 It also includes an automatic temperature compensation feature that adjusts the output voltage to assure the battery reaches its gassing threshold and achieves a full charge. The temperature compensation feature also protects the batteries from “boiling” due to overcharging at high temperatures. Battery selection by bank: On each bank, you can select what battery type you have connected (AGM, gel or flooded lead acid) to guarantee a safe, protected charge. Battery Equalization: Every time you plug in a Precision charger, it “equalizes,” meaning it cleans and conditions your battery to extend run time and battery life. You can also activate a more rigorous, complete equalization at the push of a button. Note: Only in flooded lead-acid battery setting. Low-line voltage compensation: When outlets get overloaded or hooked up to long extension cords, they don’t put out the 120 volts they’re supposed to. That makes charge times go up – unless you’ve got a Precision charger, which compensates to deliver a fast, consistent charge no matter what. For more than forty years, Marinco has been a global leader in harsh environment electrical products. They offer a broad range of high-quality chargers to more than 110 countries. And the Marinco Charge Pro Waterproof Battery Chargers are some of the best marine battery chargers of Marinco. These chargers are onboard chargers engineered for a life on the water. Combining state of the art technology with excellent corrosion and moisture resistance make these chargers a great choice for marine applications and trailered boats using group 24, 27 or 31 batteries. A microprocessor with Sense-Send technology tailors the charge to each battery bank by dividing the 10 amps available between the two banks to get the most efficient charge. Compatible with AGM and flooded deep-cycle batteries, these chargers use a five-stage charging system to quickly restore store batteries and maintain them for your next adventure. 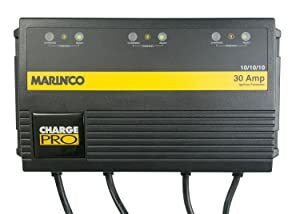 The Marinco Charge Pro chargers will accept 120V or 230V AC service and are engineered to be compatible with 12V or 24V or 36V. 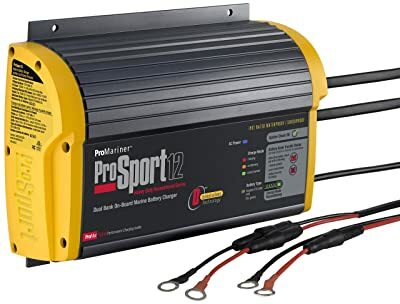 We love this ProMariner ProSport Charger because of the fact that it’s very easy to use and charge the batteries in a very efficient way. After the batteries are charged, it monitors and maintains the charge only as needed – reducing its AC power consumption. The ProSport 12 is an intelligent 2-bank 12 amp battery charger has two charging profiles for STD AGM / Flooded Batteries, and Gel Cell batteries. One of the key features of this charger is that it is capable of sensing increased demand from the auxiliary battery and diverting up to the 100% of the available power to that battery. If one battery requires only 2 of the 12 amps available, the second battery will receive the remaining 10 amps. Distribution is based on the needs of each battery. During short or long-term storage, this charger automatically reconditions all batteries on board once a month for maximum battery life and performance. Because this charger is waterproof, it can be installed almost anywhere on the boat. If there’s extra room in the budget, or you’re shopping for your very expensive boat, you want your charger is the best of the best, this unit just may be what you’re looking for. 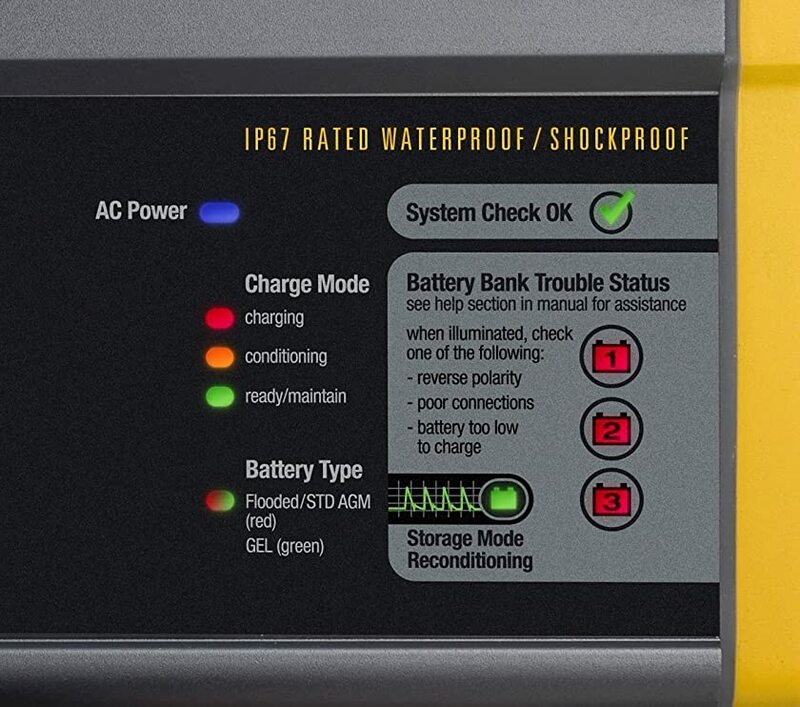 The Dual Pro 15 Amp/Bank Professional Series 3 Bank Charger is one of the best and most advanced marine battery chargers on the market that is designed especially for those who own an expensive boat. This top-of-the-line onboard charger features DeltaVolt Intuitive Charging technology. This technology utilizes sophisticated firmware (software) to enable the charger to automatically adapt to the charging needs of a wide range of batteries such as Group 24, 27 and 31. In fact, DeltaVolt technology can simultaneously charge a mix of battery sizes safely and completely. This Dual Pro charger also has reverse polarity protection, temperature control, independent outputs and Quick Logic microprocessor capabilities. Dual Pro Professional Series available in one, two, three and four bank configurations. Including features such as waterproof, independent outputs, fully automatic/multi-stage charging, and zero spark technology. 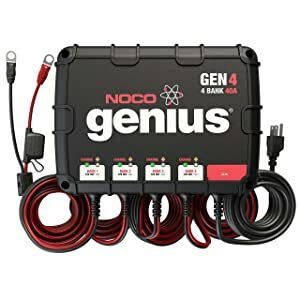 If you need to charge and maintain a variety of batteries in a range of sizes and types, the NOCO Genius GEN4 Waterproof Smart On-Board Battery Charger has you covered. It charges and maintains all types of lead-acid batteries from 25-230Ah, including Wet, Gel, MF, and AGM. Not only can the NOCO Genius GEN4 charge and maintain a wide variety of batteries, but it can also protect against reverse battery hookup, short circuit, open circuit, overheat, overcurrent and does not overcharge the battery. This on-board battery charger offers the perfect mix of high-technology and rugged construction. With a fully-sealed, waterproof housing, it can be mounted directly onto a variety of applications including boats, tractors and a wide range of equipment. Guided by an onboard microcomputer, the GEN4 monitors battery activity for safe and efficient charging, automatically minimizes energy consumption and provides redundant levels of safety protection, including spark-proof technology, as well as reverse polarity and overcharge protection. Overall, we believe that the NoCo battery charger is one of the most reliable brands in the USA, and obviously the NOCO Genius GEN4 is one of the best marine battery chargers for you. If you already own Optima BlueTop marine batteries on your boat, this is an option that you should never forget to consider. The Optima Chargers Digital 1200 Battery Charger can charge all types of traditional and AGM, 12V lead-acid batteries used in automotive, motorcycle, marine, RV and more. The MK 110P portable marine battery charger is perfect for charging a trolling motor battery in a boat where there isn’t room for a permanently installed onboard charger. Like other Minn Kota on-board chargers, this portable charger senses outside temperature fluctuations and adjust the charge accordingly, providing a fast, accurate charge.